JMS was started by 3 friends, Jason Ross, Malcolm Brewer and Simon Hardwick. The team have 60 years of combined experience in the flooring trade between them. JMS opened for business in 2016, renting a market stall in Castle Place. This gave JMS the chance to advertise themselves and provide a base for customers to visit the stall and view samples of carpet, vinyl and laminate. The business quickly grew and the need for a bigger premises became apparent so in March 2017 JMS officially opened their retail shop and office in Castle Street in the center of Trowbridge. At JMS Carpets we offer you the full service helping you choose the perfect carpet or flooring for your home. We have many years experience in the carpet business, over these years we have built strong relationships with our suppliers allowing us to provide our customers with carpets and flooring of the highest quality and a fitting service that is second to none. 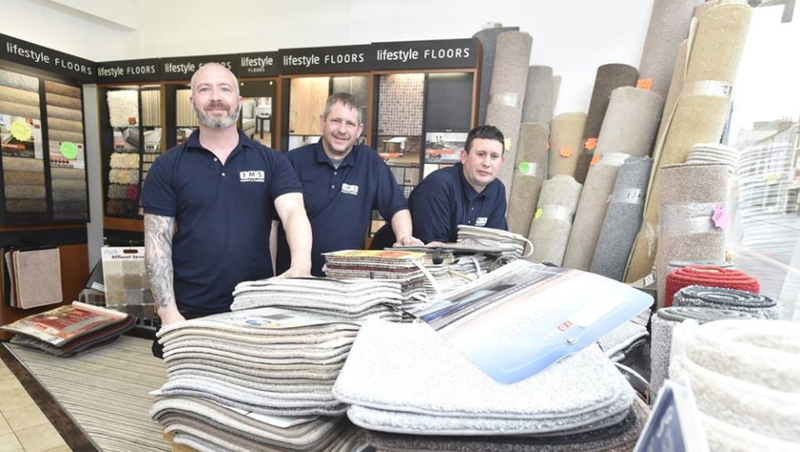 From visiting our shop in Trowbridge to choose your perfect flooring to measuring up and fitting we’ll look after you throughout the whole process. We supply and fit all types and brands of carpets and flooring so whatever your budget, lifestyle or style we’ll have the right choice for you. 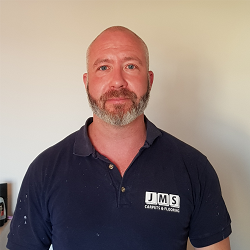 Jason lives in Trowbridge with wife Sally and children Izabella and Benjamin, he also has two dogs Rocky and Rolo. 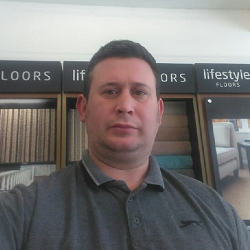 Jason has a vast background in the flooring trade including specialist flooring, LVT, Laminate, Engineered and Real wood and Safety Flooring. Jason enjoys family time and dogs walks. Is also the proud owner of a motorbike, he enjoys good food and a fine red wine!! He enjoys to keep fit. Covers the shop on Saturday on a rota basis.is. Also lives locally in Trowbridge with wife Sharon and his 3 children Harry, Georgia and Chalaina. 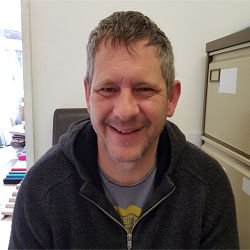 Malcolm has dedicated a large part of his working life to the flooring trade. Malcolm provides our customers with accurate measures and quotations by appointment. Malcolm is also responsible for generating a quotation for the customer. Sally or Nic will type this up in the office and send over to the customer via Email or post. Malcolm also covers the shop and office in times of need, and produces job sheets daily for the team so we know who is where and what is happening. When he gets the time, he enjoys pool, darts and poker to relax. Lives in Trowbridge with his long term partner Carrie and their children. Has a dog called Louis and keeps chickens! Enjoys motorbikes and cars. Simon has been in the flooring trade since leaving school. He’s our big friendly giant!! Si also covers the shop for holidays and rotational Saturdays. Also provides quotations and gives the customer a consultation when they are trying to decide what flooring to opt for. The wife of Jason Ross, Sally is the Shop Manager. Sally has an extensive background of Administration and Customer Service. Sally covers the shop floor during the week also working rotational Saturdays. These Saturdays are shared between the team weekly. Sally’s duties include processing accounts, wages, liaising with suppliers and customers, ordering materials for works, face to face and over the phone consultations. She is the friendly face of JMS and the first point of contact for customers visiting the shop premises. Sally enjoys relaxing, spending quality time with her family and two dogs and is also a very keen runner. 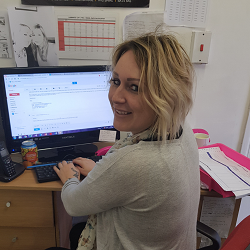 Nic is the older sister of Sally who covers the office and shop on a Wednesday, providing Customer Service and Administrative support on Sally’s day off. Nic will also provide cover when possible. She lives in Westwood with her 3 sons, dog and cat. Nic also comes from an Administrative background and likes to come to work for a break! 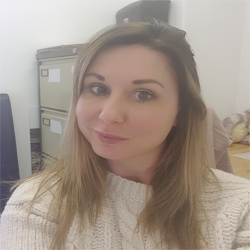 Nic designed our JMS Facebook page where we hold competitions and upload pictures of the works the team have produced.. she enjoys cooking, dog walks and prosecco! Will also attempt a run when given a free half an hour here and there!